Capable of handling very high DC bias current with minimal inductance roll off. Normally our customer specify the specs ( size, inductance, current)and we built to meet the specs. Also available in MPP, Sendust/KoolMu cores. 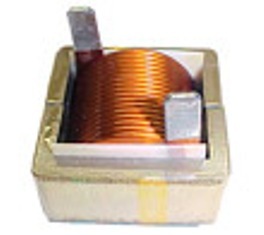 HF Series High Flux Toroidal Power Inductors. 5) "Inductance at 1 Khz" ( 2nd column from left in table below ) is the inductance measured at zero or very low DC bias current. 6) "Current Rating" ( 3rd column from left in table below ) is based on a 40 deg C temperature rise at an ambient temperature of 90 deg C. This is the DC bias current through the inductor that will cause the inductor will reach a max. temp. rise of 40 deg C. above ambient with NO AIR FLOW. 7) "Incremental Current for 20% inductance drop" ( 4th column from left in table below ) is the DC bias current that will cause the inductance to drop by 20% from the value shown in Inductance at 1 Khz. At this current, the temperature rise may be above the 40 deg C stated above, so forced air flow may be required. 8) The saturation current is at least 5 times the max current listed in 5) or 6) above, so instantaneous high current spikes can be tolerated by these inductors.